Size 42?! Excuse me?! Does Tiger know that they are making his belt in a size 42? Of course Tiger is one of the fittest guys on the planet. His biceps are bigger than my knee caps, and his waist is probably a size 25. If you wear a size 42 belt, to be as fit as Tiger you'd have to be 8 feet tall. Making a Tiger Woods size 42 belt is like designing a Michael Phelps Speedo in size triple-XL. All joking aside, this is a chic black belt with the Tiger Woods logo on the loop. I really like this belt. It is very basic with the black and silver, but you can dress it up or wear it with a pair of jeans. Tiger has some other belts that are much dressier. Check out the Nike Golf Tiger Woods Men's Croco Leather Belt with Laser Etched Hardware and the Nike Golf Tiger Woods Men's G-Flex Oil Tan Leather Belt. These belts are little spiffier because they have the crocodile overlay. 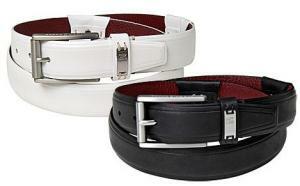 Remember: when ordering a belt, you should order one that is two sizes larger than your actual waist size. Therefore, to order this size 42 belt, you should have a size 40 waist. In light of this revelation, I'd like to rescind my previous statements. You'd only have be 7 feet tall now.